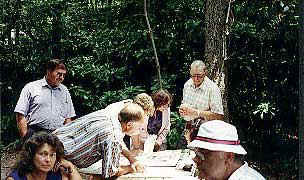 May 25, 2012: We have added photos from the 2011 reunion, which was held near Christiansburg, VA.
Plans are nearly ready for the 2012 reunion in July; for more information contact Elizabeth Biel - periwinklebiel (at) yahoo.com. 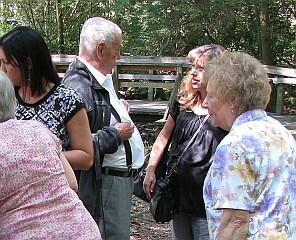 July 24, 2009: The 2009 reunion of the New River Gwinns was held Saturday, July 11 at Little Beaver State Park. It was a somewhat overcast and humid--but rather cool--day, weather-wise. The gorgeous rhododendron were in full bloom. Attendance was down this year, for various reasons. However, Steve and Betty Gwinn did a fantastic job of hosting the reunion, and Steve has already reserved Shelter 5 for the 2010 Gwinn Reunion to be held on July 10. Some 2009 photos can be found here. The address book is undergoing final updates and will be available soon. July 15, 2008: The 2008 reunion of the New River Gwinns was held Saturday, July 12 at Little Beaver State Park. There were 50 people in attendance. The weather was marvelous (about 80 degrees, and nearly cloudless). Many cameras were in evidence, and we hope that you will share your photos with the rest of us. Please email us for instructions on how to upload your photographs or videos for use on the website! The Address Book has undergone a few updates and the updated version is now available. 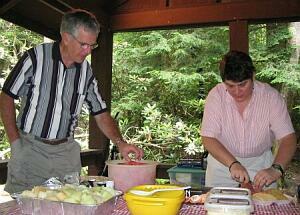 Special thanks to Steve and Betty Gwinn, who have volunteered to host the 2009 reunion. You can see photos of the reunion here. March 12, 2008: The 2008 reunion of the New River Gwinns will be held Saturday, July 12, 2008 at Shelter 5, Little Beaver State Park (same time, same place as last year). Many of you have received email about it. Some of you will receive a letter about it by regular postal mail within the next few days. Please call, write, or email us with any questions or comments! We are looking forward to another great turnout, another beautiful weekend, and the fellowship we enjoy every year. The Gwinn Reunion Address Book will be available again this year at the reunion. July 23, 2007: The 2007 reunion with about 50 in attendance, was held in beautiful 78-degree weather on July 14. As the group decided, Shelter 5 has been reserved again for Saturday, July 12, 2008. The address book will have a few updates and the updated version will be online shortly. Jon Gwinn has already made a DVD about the 2007 reunion weekend. Click here for an online video version! View other photos starting at the 2007 multimedia page!. March 8, 2007: (Posted by Tom Brown): Despite all rumors to the contrary, Reunion 2006 did take place! You can view my photos here. I would like to apologize for being so late with updates to the website. 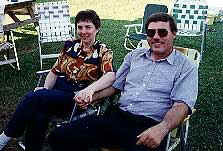 My father had passed away a month before the reunion, and we almost lost my mother (Leona) a week after the reunion! Of course, there are hardships in all families these days...so I really have no excuse. Facilities: Little Beaver State Park offers full-service restroom facilities, a playground, hiking trails, and other features. When: Saturday, July 10, 2010. Traditionally, the reunion was held on the Sunday closest to Rosa Spade Gwinn's birthday, which is July 14. In 2000, the day was changed to Saturday, to make travel plans more convenient especially for those who travel long distances and must be back to work on Monday!. People will begin to arrive at the reunion site around 10:00 a.m. for coffee and conversation, and we will eat around noon. This beautiful location is about 2 miles South of I-64 (Exit 129) on the Grandview Road. The beautiful Grandview park overlooking the New River Gorge is only a few miles to the North. Shelter #5 provides shelter from both sun and rain. It's shady at the shelter, so bring a sweater or jacket in case the weather is cool. Otherwise, dress for warm weather. This is a covered-dish luncheon. Basic picnic supplies (paper plates and cups, plastic dinnerware, tablecloths, picnic tables) will be provided. But bring one dish to share, and drinks for your family. Little Beaver State Park does not permit alcoholic beverages inside the park. Please do not feel that you must bring any food or drink. It is more important that you come to spend time with us, and we always have plenty of delicious food available. The twenty-first century has brought both joy and sadness to our wonderful extended family. The children of Loomis and Rosa Gwinn live on only in our hearts and memories. Many of their grandchildren are no longer in our midst. Each year, there is new sadness to endure. Yet, each year brings joy and new faces; there are great-grandchildren we have not seen for several years. There are great-great-grandchildren that most of us have yet to meet. The reunion is an ideal setting for catching up with all the family news, renewing old family acquaintances, and making new ones which may last for many generations to come. How do we pay for all this? Each year, many in the family make monetary contributions so that the reunion can afford to rent a shelter and provide basic supplies for the following year's reunion. These funds are invested in a simple, low-risk vehicle (actually, a tin can) and used to make the necessary payments for shelter and supplies. Come to the reunion! See the tin can! Tom and Donna Brown and First Computer Services have contributed the time and expense of this website. No contributions have been used to pay for it. Come back soon for more news; and--please--try to attend this year's reunion. September 20, 2002: On Labor Day weekend, three Great-Grandchildren of Rosa Spade Gwinn, their spouses, and a wolf journeyed to Round Bottom in the New River Gorge. Read about the visit and see photographs here.